I’m back! It’s been a long week away from Cooking in Red Socks. We drove home from Boston to Colorado stopping in New Haven for Ryan’s Yale Alumni Baseball Game, Philadelphia to see my college friends, and Chicago to see my family and Kidd. After that we hustled home to attend to a family illness. I can’t tell you how happy I am to be home. Not only am I back with my family and back in Colorado after 9 long months, but I am also reunited with my kitchen! If you’ve noticed my posts of late have not been recipe oriented. We have lived in a hotel sans kitchen for the last TEN WEEKS! Needless to say I am back and ready for some great, home-cooked meals. We stopped in Chicago on the way home to visit my sister’s boyfriend, Kidd, just in time for Monday night football. I couldn’t really ask for a better audience for potato skins than Ryan and Kidd- big eaters who love their bar food. Potato skins are such a classic appetizer, so I was excited to put a fun and healthy spin on them. I’m happy to say my first attempt back in the kitchen was a success! Sweet potatoes are a much better alternative to white potatoes because they retain their moisture during the cooking process. They are juicy and tender compared to dry, yucky potatoes. What’s the point of having all of these delicious toppings on a chalky, dry potato? 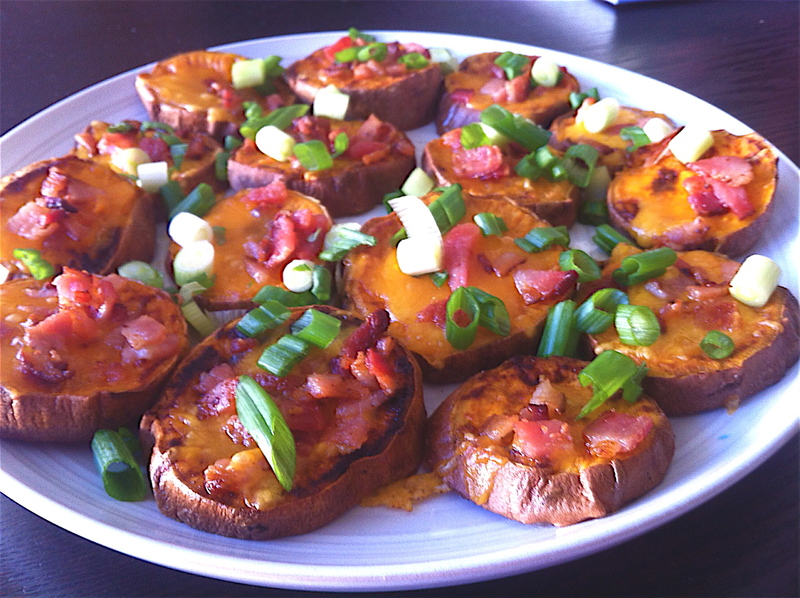 And about those toppings… potato skins are up there in the unhealthy appetizer category. Not these! Using just a little bit of bold flavored ingredients makes for a mouth-watering appetizer. You won’t miss the original! So here’s the better alternative, which is festive for fall and a delicious accompaniment to whichever football game you are watching this weekend. Wash the sweet potatoes and scrub with a brush if necessary. Pat dry with a paper towel and leave the skins on. Slice the potatoes into 1/4 inch rounds, spreading them evenly on two cookie sheets. Spray both sides of the potatoes with olive oil cooking spray. Season one side with salt and pepper; flip the potatoes and season the other side with the paprika, garlic powder, onion powder, and cayenne pepper. Place the potatoes in the oven and bake for 15 minutes. Remove from the oven, flip the potatoes, and bake another 10 minutes. This allows both sides to become crunchy and helps them hold their shape. While the potatoes are cooking, heat a large saute pan on medium heat. Cook the bacon for about 7 minutes, or until it is starting to brown and turn crunchy. Remove from the heat onto paper towels and drain the excess fat. When the bacon is cool, mince into small pieces. Set aside. Shred the cheese and mince the scallions as well. Remove the potatoes from the oven and side aside to cool for about 3 minutes. Turn the oven onto high broil. Sprinkle the cheese on top of the sweet potatoes and then add the bacon. Put the potatoes back in the oven one sheet at a time on a lower rack for 3-4 minutes, or until the cheese is melted. Remove and add the scallions immediately so that they stick into the cheese. Repeat with the second tray of sweet potatoes. Set aside until they are cool to the touch before serving. Those sound fantastic. I love sweet potatoes and this sounds so easy. Can’t wait to try them this weekend. Thanks!